Since today is my actual due date I thought it would be a good time to share my birth story. While I was pregnant I was unsure as to whether or not I would share it but it was such a great experience I don't see how I can't. I think it is important for people to hear about good labours and deliveries so that maybe less people will be afraid of giving birth. On Thursday June 20th when I was exactly 37 weeks I started to feel a little different. It kind of felt a bit like I was about to get my period. I was a tiny bit (and I mean just a tiny bit) crampy and I noticed a few other things as well that were just different. I told Ivan that I didn't know what it felt like before you go into labour but that I felt like my body was getting ready. Whether it was getting ready for something that would happen the next day or in five weeks, I didn't know. On Friday morning I woke up to go to the bathroom (as pregnant ladies do many times a night) at about 3:00am and as I was on my way down the hall...my water broke! I said to myself, "Oh, I guess my water just broke" and continued to the bathroom. I called down the hall to Ivan to calmly let him know but told him to go back to sleep. I thought I remembered the midwife telling me that if you go into labour in the middle of the night just try to go back to sleep so that's what I tried to do. I was pretty wide awake at that point though so I just kind of lay in bed and goofed around on my phone for a few hours. Ivan's alarm goes off for work at 6:00am so I am going to assume that is the time we ended up getting out of bed. I wasn't having serious contractions at this point, just mild ones, so we got together everything that we needed for the homebirth which we had thankfully just finished picking up the week before. We also tidied up the house and Ivan washed our bed sheets so that they would be nice and clean if we did in fact have the baby that day. As we were cleaning my contractions started getting stronger and they were between four and six minutes apart and lasted anywhere from a minute to two minutes. I think it was around 7:00am when I had a contraction that made me throw up and I figured it was about time to call the midwife and just let her know things were happening. I should mention now that for some people I'm sure throwing up during contractions sounds awful but I didn't mind at all. It wasn't totally pleasant but it gave me something else to focus on. Also, it didn't happen everytime, just everytime things kicked up a notch or two. Anyways, we paged our midwife and she called us back and talked to me during a contraction to see how things were going. I was still able to talk so she said that she would come over to drop off the birthing tub and the supplies that they needed to keep in the fridge in an hour or so. Those things should have already been at our house but my home visit was scheduled for the next week so they hadn't been over to drop that stuff off and go through how things would work on the day of the birth. No big deal though! We continued to putter around, pausing for my contractions, until the midwife arrived. She brought in everything we needed to get the tub set up and then said she would check me. I was 1-2cm and "stretchy" so things were definitely progressing well already. Since my contractions were already about four minutes apart she told me she was going to leave but to call her when they got stronger. I remember thinking, "How am I going to know when they get stronger?". Silly me. After the midwife had left Ivan called our parents to let them know what was going on. We also needed to get a hose to run from the bathtub to the kitchen where the birth tub was going to be set up so Ivan asked my mom if she could come over and sit with me while he went to get it. He very casually said "sometime before noon" but my mom figured that it would be better to get things done sooner than later so she came over right away. By the time my mom got there my contractions were getting a bit stonger and she told Ivan that she would go out and get what we needed so that he could stay with me. I think at this point I moved from the bathroom to the couch where I kneeled on the main part of the couch and leaned over the couch arm to deal with contractions. I really surprised myself with what I liked during contractions. When I had my kidney stone I did not like to be touched while I was in pain so I thought it would be the same with contractions. It was the total opposite. I absolutely needed someone touching me while I was having a contraction. Sometimes I liked to have my lower back rubbed and sometimes I just wanted Ivan to rest his hand on my back. I was very much in my own world with my eyes closed during labour but I needed to have that connection with the real world during contractions. Ivan was totally amazing the whole time I was in labour. I couldn't have asked for better support. Probably by about 11:30 or 12:00 I started having much more intense contracions ( I could totally tell) and I asked Ivan to page the midwife. She arrived very quickly and at that point I was glad she was there. She checked me again and I was four centimeters and in active labour so she wasn't planning on going anywhere at that point. This is where I really lose track of time. I laboured in that same position on the couch while things went on around me. My midwife called the midwifery student who had been at my appointments to join us, the tub was being filled and I'm sure lots of other things were happening too. Having the student there was really great because she acted as extra labour support, passing me water between contractions, rubbing my back if Ivan was in the other room doing something with the tub, passing me my barf bowl and other glamourous things like that. At some point the tub was ready (maybe around 2:00? I have no idea) and I was checked one last time before I got in. I believe I was 5 centimetres at that time and the midwife told me that I had got through the part that takes the longest. Getting from 5 to 10 would go much more quickly. I got in the tub and it was so amazing! The warm water felt fantastic and I was pretty comfortable on my knees leaning over the edge of the tub. I continued to labour in there and then eventually I had two or three contractions that were much more intense than the ones I had been feeling and I started to feel pressure and the urge to push. I was checked and sure enough I was 10 centimetres and ready to push. My midwife called the second midwife who just comes while you are pushing. She also had a student working with her and I said it was ok that she came as well. My main midwife was actually supposed to leave at 4:00 because she had a previous commitment and had arranged for my other main midwife to show up at 4:00 to take over for her. Well, my other midwife showed up but the one who had been with me all day didn't end up leaving because I was in the pushing phase at that time and she wanted to be there for the birth if she could. So...there ended up being three midwives and two students there at the end. This is something that I thought I would have hated, having that many people around, but I ended up being really happy to have so much support. Everyone just blended in so well and knew exactly what to do I never felt like there were that many people there. I feel really lucky that I had so many people there for me helping out in different ways. When I started pushing I was on my knees leaning forward. At some point someone told me to reach down and feel his head. It wasn't out a lot at that point but I could feel something squishy and I said, "I just feel something squishy, is that it?". They told me it was and I decided that feeling the head was not for me. I totally trusted that my body knew what it was doing and I am not grossed out by birth at all but I didn't like feeling the head for some reason. I don't remember this but Ivan told me that they asked me again later if I wanted to feel the head again and I politely declined. At some point the midwives were checking on his heartbeat, which had been perfect the entire labour, and they couldn't find it. What they thought was his was actually mine and I got a little concerned. The midwives were very calm about it and they had me switch on to my back and push that way for a while. I guess his head kept on coming out a bit and then going back in because it was having trouble getting around a bone. I remember asking after one push "Did it go back in?" and the midwife said no. Ivan told me later that they totally lied to me and it had gone back in. I find that hilarious and more proof that midwives know just what to say to you while you are in labour. After pushing on my back for awhile my midwife said, "Ok, you need to push him out, flip back over onto your hands and knees". I flipped back on my hands and knees and I vaguely remember someone knocking on the front door. The midwives thought it was a neighbour or something but I found out later that it was my mom dropping off dinner for us. Apparently the midwife told her I was pushing and she dropped the food on the coffee table, asked if I was ok, found out I was and then left. We had told people that we just wanted it to be Ivan and I at the birth so that we could spend that first bit of time together as a family. I am really touched that my mom respected that especially when she was there just minutes before he ended up being born. Ok, sorry back on track. Once I was on my hands and knees I think I gave a few good pushes and he came out all at once, head, shoulder, body, everything! I reached down, grabbed him and leaned back against the wall of the tub. Seeing him for the first time was completely nuts and I remember it and don't quite remember it all at the same time. 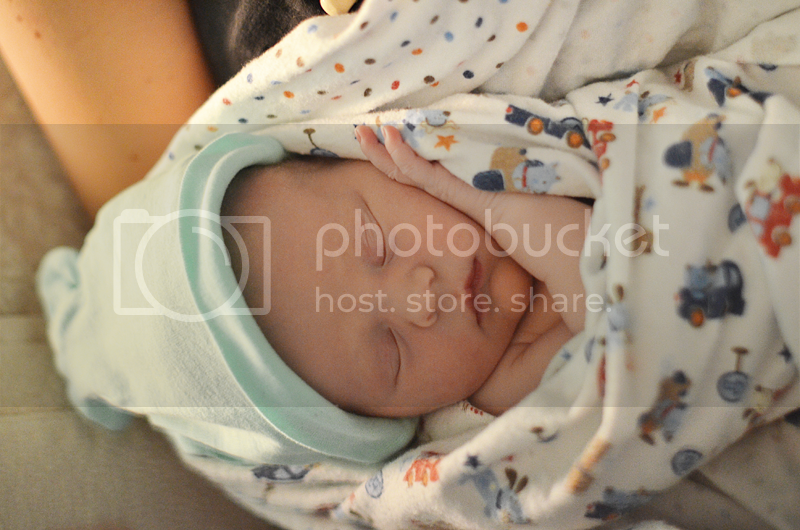 Ivan took a couple photos right after he was born and I am really happy to have them. 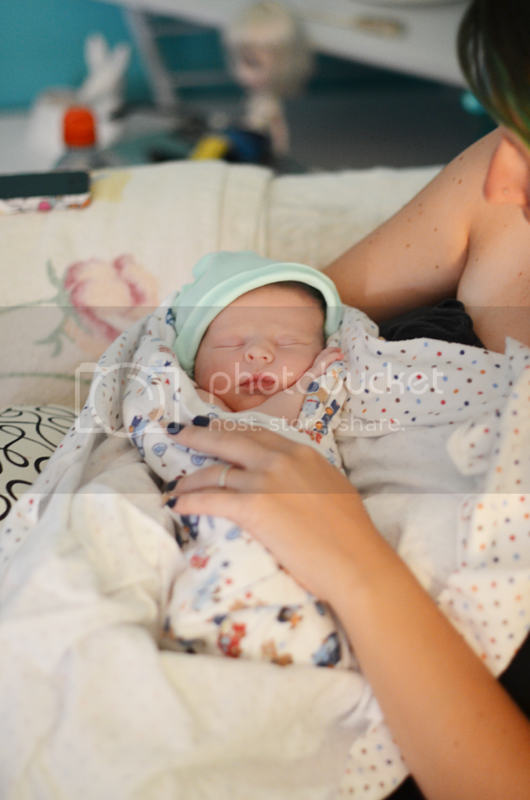 Our little Milo was born in our kitchen at 4:24pm on June 21st, 2013 at 6lbs 5oz and 19.4 inches long. Turns out he was sunny side up and coming out with the front left side of his head first instead of the top which I think is why it was a bit hard to get that part out. He stayed on my chest for a short time but then they had to cut the cord and take him a step away to the table to get him to give a good cry. He wasn't blue or anything but he just wasn't responding as much as they would like. After a few moments he was crying and perfect and they gave him right back. Ivan and I are so unbelieveably happy with our baby and our whole birth experience. Like I already mentioned but can't properly express my full feelings on, the midwives were amazing. They know exactly what to say and do and are very good at being there for you but also blending in to the background and letting you do the things that you want. We are so, so thankful that we had such amazing care during the birth and for the few hours and days afterwards as well. I can't recommend midwives enough. In case you are wondering, I was under the care of Community Midwives of Hamilton. A few general things that I found about labour: I had no concept of time throughout the whole thing which was good for me because I wasn't worried about how long it had been going on already or how much longer it might last. Contractions are the most intense feeling I have ever experienced but they were definitely manageable. That being said, I totally understand why people choose not to experience child birth naturally. I completely get every option out there for giving birth and I think it is important for people to educate themselves and choose what they are most comfortable with. I was already very non-judgemental about people making decisions that were different from mine but I feel even more strongly about not judging other people's decisions related to childbirth now. What is ideal for you is not idea for someone else and being comfortable in labour is the most important thing. For me, having a homebirth was one of the best experiences of my life. I didn't think about a lot during labour but one thing that kept going through my head was, "I am so happy to be at home." I know that not everyone would feel that way but I think it is so important to get a good idea of what you would be comfortable with and go with that. I knew I would be most comfortable at home and I think that being so comfortable helped me stay calm and also helped my labour progress so smoothly. For me giving birth was an amazing experience and I credit that to trusting that my body knew what to do and putting myself in a comfortable situation surrounded by the right people. Like I said, my ideal situation will be different from someone else's so everyone needs to figure that out for themselves. I think that this was the longest post I have ever written and I definitley wrote it as much for myself as for you guys to read. I have probably already forgot and left out some details but I really happy to have this documented. Thank you for reading. PS. If you have questions about anything I didn't mention just let me know! Aww.. Milo shares the same birthday as my Mom! I'm glad everything worked out well for you with the home birth! what a wonderful experience for you Elycia!! Oh god, this is my favourite blog post ever! I actually got a little teary reading about how happy you were when he finally popped out :) thank you for writing this post, I have never really read/heard anything as in depth in detail as this and I'm actually quite calm about the idea of giving birth (whenever it happens!) because of the way you've described yours. Sure, it could go totally differently and be nothing like the way you described but I can't wait to experience it now! Yay! Such a sweet story and perfect pictures to go along with it. Congratulations!!! ah! i love a good birth story and this one was amazing!! congrats - he is perfect! Thank you so much for sharing Elycia. I always marvel at mothers, as in my head I don't know how I would manage! It sounds like you were a complete superstar during the whole thing :) Congratulations again on the birth of Milo! as someone who is terrified of child birth, you made it sound so much less scary :) congrats and Milo is the cutest baby! i just teared up a little when you went "back on track"... and i am usually not that kind of person. thank you so much for sharing this! i hope i'll keep your advice in mind when my time to decide how i'll have my child comes... thank you! awwww!! beautiful story, beautiful baby!!! Such a wonderful and inspiring story! I´m glad everything went so good for you! I love that you shared this. I'm absolutely terrified of childbirth (mostly because of my own medical issues - I have epilepsy that's triggered by pain)... but I also really don't like doctors and/or hospitals. If I were to ever have a natural birth, especially after reading your post, midwives would be the way to go for me. Thanks again for sharing, he is a gorgeous little boy - and it's great to hear everything went so well! I really enjoyed reading this and I commend you for being so honest. I think it is super important to weigh all of your options and not be bias. I really can't wait until I'm ready to have a family and I hope I remember to come back and read this post. Congrats! Your story was wonderful to read. I'm glad everything went so smoothly and I hope you're enjoying yourself spending time with the little guy! How beautiful! Thank you so so much for sharing your story as this is something I've been heavily considering and stories like yours help me know its right. I am such a sucker for birthing stories! And since I had my little guy two years ago, every time I read one, I go all mushy and teary. Yours was amazing, and it's completely clear how comfortable you were with the whole thing. Congratulations on the brilliant birth and the cutest little Milo ever! Thank you so much for sharing your birth story. It's something I would be interested in given I was pregnant, and it's always amazing to read about positive experiences. Congrats again, he is beautiful! Oh this is so excellent and really eye opening! I am so glad you chose to share your story. Congratulations again! What a beautiful, and absolutely fascinating post. Thank you so much for sharing such a personal story, but what a wonderful way to record it for the future! Milo is truly stunning, and I wish your gorgeous little family all the love in the world. This was so beautiful. I'm still crying over it. It's so important to go through birth how you feel most comfortable, and you can really see how comfortable you all were throughout. Love you all, congratulations (again and again and again times infinity!) on your happy family. Thank you for sharing It's a beautiful story. When I had my boys there was no option for midwives up here. I was in labour 14 hours and I get you no concept of time. Milo is beautiful! Congratulations! Thank you for sharing such a personal, emotional story with us. It sounds like you had a wonderful, supportive experience giving birth. Congratulations to you and Ivan, and many blessings on little Milo! Thanks so much for this, it was a wonderful story. I also think you have the most amazing attitude towards childbirth, and more people should think that way! Congratulations on your BEAUTIFUL baby (and family)! What a beautiful birth story! I don't usually watch or read birth stories because sometimes people make them seem like horror stories! I opted to have a doctor and deliver at the hospital for my baby but for some reason I don't really remember even being offered a midwife or any options besides delivering at the hospital. That being said, if I had been given other options, I probably would have just stuck with the hospital. Even though I am pretty afraid of them, I felt oddly comfortable there for my delivery - I knew everything I needed was there and that I was safe had anything happened. I have to congratulate you on choosing not to have your mother there! I felt like such a wimp because I insisted my mom be there haha! I don't know why but I never documented my birth story and this has inspired me to write mine out and maybe post it to my blog one day. Milo is gorgeous, you have such a beautiful family! Thanks so much for sharing this. I always thought that I would have a home birth (i hate the idea of drugs, and hospitals freak me out) so its nice to know they can go super smoothly and be enjoyed by everyone involved. Aaaand, now I'm crying! This was such a beautiful story and I'm so appreciative that you shared this with me. I'm not a baby person at all but you've actually started to change my mind about whether or not I'd like to have a little one of my own one day. Thank you for sharing this experience! 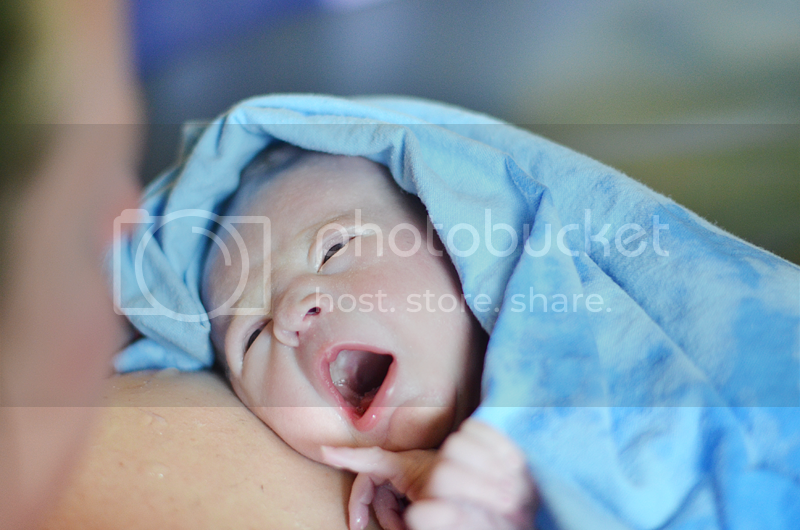 :) I wanted to have a water birth with my son, but they didn't have that option at the hospital I was to give birth at. I'm happy you had a good experience. Milo is gorgeous! this moved me to tears. beautiful. what an inspiration! This was just a beautiful thing to read. Thank you! i'm so happy you wrote this great post about your experience! we're trying to have a kid and I want to do a home birth to and this was so inspiring. and i love that picture picture of you holding him when he was first born, it is so beautiful, even just seeing that little part of your face! Thank you for sharing. What a wonderful birth story! I just love your birth story. (and all the Milo photos we've already gotten to see. X)) Thank you for sharing! My natural childbirth was incredibly manageable, though transition was very, very intense. 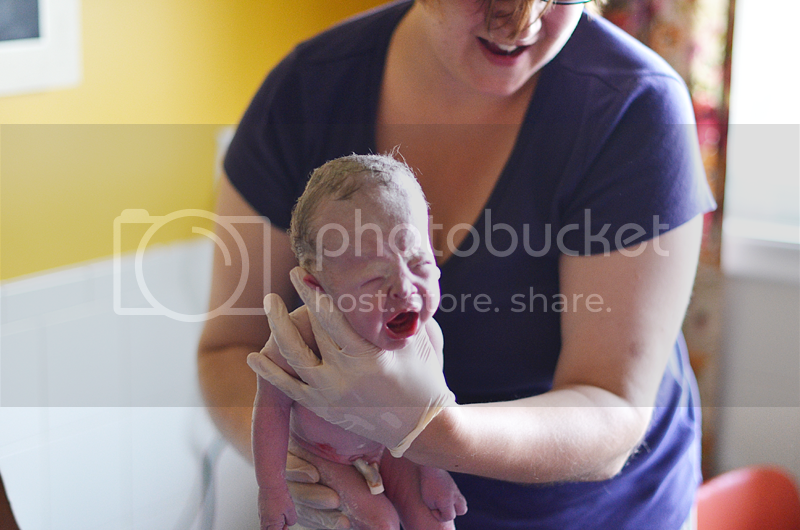 That was a Birth Center birth- if I ever end up giving birth again, home birth is at the top of my list! Such an amazing experience and emotional post. Thank you so much for sharing. So happy for you! Thank you again for sharing this lovely birth story, it definitely takes some of the fear away. Have a lovely day, Elycia. awww, cute baby, congrats mom. What a nice experience and a beautyfull story ! I'm always so happy to read the words of women who choose to respect and trust their bodies, lovers and midwives ! I come around on your blog often and I'm really happy for you ! I have to say, two tears of emotions drop out my eyes while reading your text ! so full of tranquility and emotions ! thanks for sharing this ! congrats again to you guys! Aww congratulations, he is just wonderfull! ♥ Thank you for sharing this experience with us! Such a beautiful uplifting story! No birthing story has ever brought me to tears. It really is beautiful. I'm so glad you had this experience and congratulations on such a perfect, precious little baby. Thank you so much for sharing your story. I've never read a more positive "natural birth" experience story and to be honest, it really helps me when I read these things (despite the fact that I am only 17). So honest and shared from the heart. Thank you for sharing and your baby is so sweet! I had a homebirth and really love how you shared the experience with all of us. That was so beautiful. Thank you for sharing. Mr. Milo and you have an amazing birthing story! Wow. I was so young when I had my two minions and didn't even think about having a non-hospital labor. This sounds amazing. If I ever have another kid I would totally choose this route. Midwives are much more caring and relaxing it seems like. The worst part about a hospital labor is that you can't move around.. I hated that! I first found your blog when searching for "21 week" stories, as I am currently 21 weeks (and in a bit of an interesting hormonalinsanity patch). I'm totally hooked now after reading your gorgeous birth story. We are so excited about our homebirth which will hopefully happen in mid/late November! You're beautiful, your baby is beautiful, sooo many warm congratulations from a doula and new fan. So following this blog forever. thank you so much for sharing this. My due date is on the 4th of August, and it is really encouraging to read that giving birth can be a great experience! And congratulations on Milo again. Can't wait to meet my little boy. Thank you for sharing this story! It IS really helpful to hear childbirth stories that go well and smoothly! I am pregnant myself (almost 14 weeks!) and so I was really interested in reading this story. Unfortunately, I am a high risk pregnancy so I won't have the option of a home birth, but I loved hearing about yours and I totally get how being at home would put you more at ease and make for a less stressful birth. I'm so glad yours went so well and am so excited for you and Ivan and your little Milo. I wish you all the best! Thank you for sharing this with us! I got a bit teary eyed and you have made me think of midwives as a option when giving birth due to your experience. Thank you again! What can I say, thank you! for sharing this beautiful story <3, i was pregnant like you, but two weeks older, and my baby born in 39 week, sunday 23 of june hehe, she born in the same conditions than milo but in a hospital, natural born, and i think it was the best choise I could ever made, im glad that more women are taking this choise, 'cause is absolutely wonderful to understand, live and share this feeling, and have the memories to tell to our children something this beautiful like them birth. I always read your blog, and it was glad to know that you were pregnant almost at the same time than me, but i dont think we were in birth labor the same weekend! congrats! we're brave! we have to share this amazing moment with more women, tell them that "birth labor planet" exists haha! Regards from Chile, South America, to you, Ivan and Milo. Thank you...so much for sharing that! (as I wipe tears). Brings back memories, and kinda makes me wish I had tried a home birth. Congrats again! Such love! Thanks for sharing your story. My boyfriend and I would like to have a home birth when we have kids. I always love the opportunity to read one!! I'm so happy it was such a beautiful experience for you both! Congratulations! how did you decide on the midwives that you chose to work with? did you look around a lot? To be honest, I Googled midwife clinics in Hamilton and choose the one who's website I prefered. My midwives were assigned to me based on availability but now I would request them if I were pregnant again. This is a wonderful, wonderful story. I have a question about homebirths. After having the baby, do you and/or hubby have to clean up the house?? That always seemed like it would be so intensely stressful to me! Do the midwives clean up everything before they leave? There wasn't much too clean up actually. The midwives are really helpful and the only thing we really had to do was drain the birth tub and put it away. During the birth the midwives asked for two garbage bags, one for garbage and one for laundry so everything basically stays neat and tidy the entire time. I haven't watched it but I keep meaning to check it out! Your baby is so beautiful! Your writing style is lovely. Thank you for sharing. I'll be considering so many of the things you chronicled in a more educated way now. Love birth stories! Congrats! I laboured at home and throughout my pushing phase-but her head was coming out at a strange angle and needed to transfer. I had 2 midwives, 2 midwifery students (one was an international student from Denmark), a doula, and my partner. I liked having everyone too. Time is weird during labour. I went into labour early in the day, and started pushing after midnight (she was born at 5:45 am). I was amazed that everyone was so upbeat and didn't show that they were tired. As Stephanie Piccirilli said, "As someone who is terrified of child birth, you made it sound so much less scary". I am due in December with my second son and our due date is on my man's birthday (how fun! ), so it definitely made me scared when I started looking at the labor room in the St. Mary's Hospital (the hospital has options for both induced, natural birthing and water births with aromatherapy and birthing balls). Reading this story made me feel more at ease about having a water birth and knowing that contractions are manageable. Thank you so much for sharing and congratulations on the birth of Milo! Beautiful birth story! Thank you so much for sharing! Wow! I fall behind on blog reading over the last 6 months and you have had a baby! So wonderful! I also had a home birth with my first child and although much of the circumstances were different (it was a very fast labor), so many of the feelings were exactly the same. I love that. 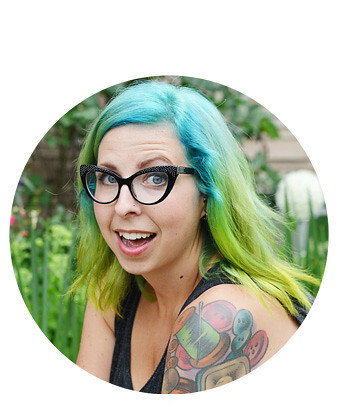 I love that you shared your experience, I wrote mine out also (http://www.strawberrymohawk.com/2012/05/do-it-yourself-birth-my-birthing.html) and I think it's crucial for us to get our stories out there, because women in this country are constantly bombarded with scary or traumatic hospital birth stories. I'm not pregnant with my second child and reading your story has motivated to go pick up my Ina May books and read more stories! Congratulations mama, you did an amazing job! Lots of love to your sweet family! My daughter told me I should come and read this blog. I had her in a birthing center called Familyborn in Princeton, New Jersey. Familyborn was a freestanding house unconnected to a hospital and I gave birth with the help of wonderful midwives in a double bed and later sat outside on the porch in a rocking chair holding my baby. My daughter was one of their first babies born 30 years ago, and my seventeen-year-old was one of their last babies born. How lucky we were! These were the most beautiful experiences of my life! Sadly, Familyborn had to close down because the malpractice insurance was unaffordable. (Insurance companies and lawyers are the bane of society.) I worry that my daughters don't have this option anymore. Hospitals scare me. They are full of germs and diseases and unnecessary interventions that cause problems. Having a baby is not a sickness! But we are brainwashed in this society to treat it as such. You really have to be a special kind of person to have your baby at home, considering what we've been indoctrinated with. Even though I was brave and never the type to blindly follow the crowd, there was a doctor on call at Familyborn and the hospital was five minutes away if needed. I hope my daughters are even braver than I was and have their children at home where it is the safest for normal births and the most peaceful. Unless something new came out since I got that sad letter informing me Familyborn had to close down, they have no other choices. I also could not touch the head, by the way, lol. I wanted also to say that Milo is gorgeous! What a wonderful story! Thank you so much for sharing your experience! You look great with Milo ^-^ Congrats your lovely family.